BRITISH is a fun word game to play with friends or to prepare for a trip across the pond! The MULIPLE CHOICE QUIZ shows you a British word and you choose the American word from the choices. Then you see if you were right or wrong. But what makes this quiz smart is the progress tracking in the background. 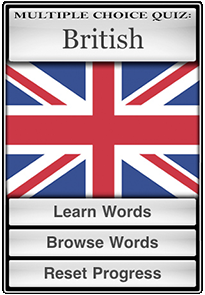 The PROGRAM REMEMBERS which British words you have trouble with and which you have learned well. It focuses on helping you remember the problematic words, while using longer spans of time between repetitions of words you already mastered. Learn INTERESTING BRITISH WORDS that are not used the same way in the United States. Have fun and catch your British friends off guard when you show them how brill you are with your new British vocabulary! - IT'S BRILLIANT! And you're learning!